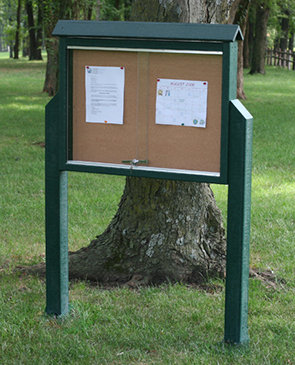 These outdoor message centers are made from durable Resinwood recycled plastic and feature top-quality cork, shatter proof acrylic windows, anodized aluminum frames and weather proof locking mechanisms. With 100% recycled plastic frames that will never rot, chip, peel or slinter, these message centers are great for both outdoor and indoor use. The high-impact acrylic doors with provide a clear view that will not yellow, slide smoothly and lock securely with vandal resistant hardware. To ensure the ability for effective placement these community directory message centers are available in a variety of configurations and your choice of the Resinwood color options as shown.